A normal computer operates using bits, which can be either 0 or 1. A quantum computer uses qubits - a quantum state, which can be 0 or 1 or both at the same time. This allows a huge increase in computational power. To do actual computation with a quantum computer, we must be able to manipulate the state of the qubits. In order to do this, we need a way to connect the two states, and it is sometimes experimentally challenging. However, there is a trick to make it easier; we can use a third quantum state as a stepping stone. Instead of coupling the two states directly, we can couple each of the states to a third state. The third state is then used to mediate the coupling between the two original states. The purpose of the three-level game is to find the fastest way to connect two states using a third state. Can you beat the record? A qubit can, for example, be realized in the energy structure of an atom. The electrons in the atom can be in several different configurations. By applying a laser with a very specific frequency to the atom, we can change the state of the system back and forth between two configurations. Since the laser only couples two configurations, we have a qubit! However, for some configurations it is difficult or expensive to produce a laser with the desired frequency. Here, we can make use of a third electronic configuration. The two original states are then coupled to this third state using two lasers. The third state can be chosen such, that the two lasers are easy to realize. Now we have an effective coupling between the two original states, just like we wanted! In the three-level game, you control the intensities of two such lasers. The system starts in the 0-state and the goal is to steer it to the 1-state in the fastest way possible. For example, turn on the first laser and wait until the system is in the third, extra state. Then, by turning on the second laser, the system is steered from the third state to the final state. However, this is not the fastest way to do it. An open question in quantum physics is exactly how such an operation is performed in the fastest way possible. There is a fundamental limit of this time, known as the Quantum Speed Limit (QSL). In fact, this problem has been solved for the two-level system. However, we don’t yet know the fastest solution for the three-level system. Recently, an article was published in Nature, where a fast solution is presented. See the figure below, where the two laser intensities are shown. The strange nature of quantum mechanics allows for some weird and interesting solutions. For example, we can start by turning on the second laser first, and then slowly turn it off while turning on the first laser. This will steer the system from the 0-state to the 1-state without ever being in the third state! Try it! Just the fact that the third state exists allows for this solution. This is really cool since we sometimes don’t want the system to be in the third state, as it can be unstable. This particular solution is called STIRAP (Stimulated 2 Raman Adiabatic Passage) which is widely used. Gerhard C. Hegerfeldt. Driving at the quantum speed limit: Optimal control of a two-level system. Phys. Rev. Lett., 111:260501, Dec 2013. Yan-Xiong Du, Zhen-Tao Liang, Yi-Chao Li, Xian-Xian Yue, Qing-Xian Lv, Wei Huang, Xi Chen, Hui Yan, and Shi-Liang Zhu. 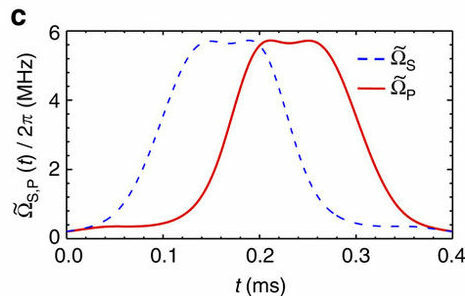 Experimental realization of stimulated Raman shortcut-to-adiabatic passage with cold atoms. Nature Communications, 7:12479, August 2016. Nikolay V. Vitanov, Andon A. Rangelov, Bruce W. Shore, and Klaas Bergmann. Stimulated Raman adiabatic passage in physics, chemistry, and beyond. Rev. Mod. Phys., 89:015006, Mar 2017.